Chef Oonagh has always cooked from scratch with real ingredients and has a deep knowledge of food and the ability to fully understand food labels. Chef Oonagh has helped numerous people with their food intolerances, or those who want to eat more 'real' food and less processed food, while keeping costs in mind. Most 'real' food should be naturally gluten free and also free of many food allergens, chemicals, preservatives and all the stuff we don't want and don't need in our bodies. Chef Oonagh will help you cook tasty, healthy foods as well as avoid foods you can't tolerate. Interactive Talk - "The Power of Food – You are what you eat"
Chef Oonagh Williams, who has appeared regularly for many years as the featured Chef on NH's ABC WMUR's Cooks Corner, presents The Power of Food – You are what you eat. Food can be the best medicine for your body or the worst poison. 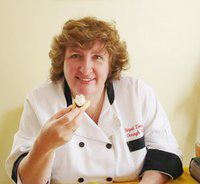 Chef Oonagh, has a Culinary Arts degree, always cooked from scratch with real ingredients. She has a deep knowledge of food and presents in a lively, entertaining and informative manner - all with a very British accent. Is GMO a good thing? Is "fat free" and "sugar free" better for you? The increasing number of food allergies, not just gluten free. Chef Oonagh discovered when she went totally gluten free - initially because of her son - that her arthritis pains and monthly period pains went away. Be reassured, Chef Oonagh eats real food, enjoys her chocolate, couldn't give up cheese and doesn't follow any strange food plan. This interactive talk is $10 per person, in a group class. Duration is about 2 hours. Location is at YCD Holistic Healing, Nashua NH - see the "Talks and Workshop information" section below. This is on Main Street, in the brown brick, Whitney Professional Building, near the Southern NH Regional Medical Center. Free Parking. E-mail Chef Oonagh with any questions. 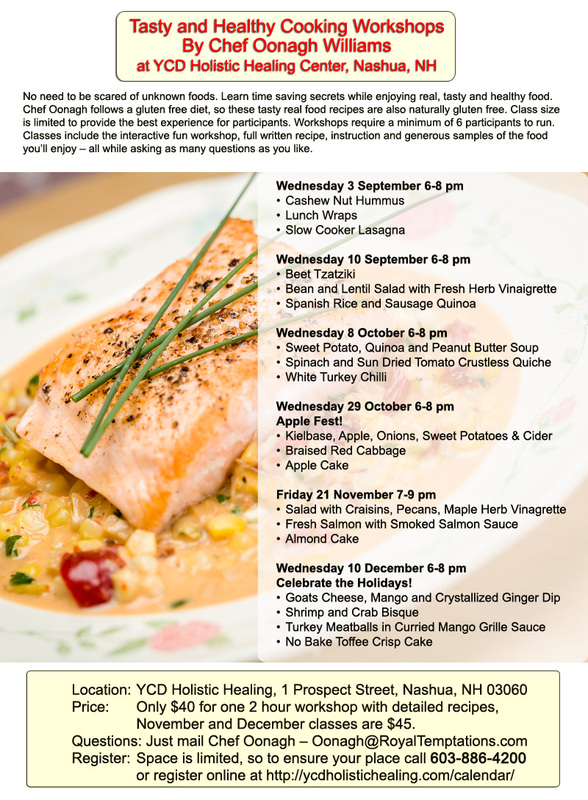 Class numbers are limited, so to ensure your place, phone 603-886-4200 or register on line at YCD Holistic Healing. Scroll down to class you want, verify workshop date and time , then register. PayPal account is not required to pay. Site © 1999-2014 Oonagh Williams, All rights reserved.